An Arctic spitz breed, the Finnish Lapphund breed originated in 7000 BC in Finland. They were highly adept as watch dogs and at herding reindeer. 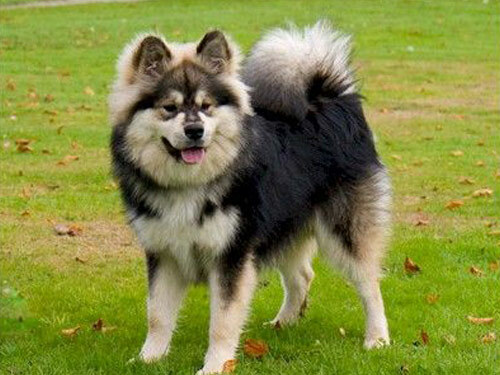 Today the Finnish Lapphund is popular as herding dogs of cattle and sheep and as companions in their native Finland and other European countries. However, they are quite rare in North America. The Finnish Lapphund is strongly built, of medium size, sturdy and hardy. They possess a bright, intelligent expression and a striking appearance. Finnish Lapphund's are active, agile, and intelligent. The Finnish Lapphund breed is loyal, devoted, and calm. They are excellent with children, dogs, and other household pets. The Finnish Lapphund is wary and suspicious of strangers and will bark to alert their family. They are non-aggressive, affectionate, courageous, and exuberant. Regular brushing is required of the Finnish Lapphund breed. Special attention should be given to the coat during periods of heavy shedding. Bathing should only be done when absolutely necessary. This breed is relatively healthy although some are prone to cataracts and GPRA. They do best in colder climates. The Finnish Lapphund is a double coat breed. The outer coat is water-resistant, long, profuse, coarse, and straight. The under coat is downy, dense, and thick. Males shed heavily once a year, females shed heavily twice a year. The Finnish Lapphund must have early socialization and obedience training. Sessions that are short and varied are best as Finnish Lapphund's have a tendency to become bored easily. Training must be done with firmness, fairness, and consistency. This highly active breed requires an active owner. Finnish Lapphund's do best in a large securely fenced yard or a rural setting with room to roam and a job to do. The Finnish Lapphund excels in agility, obedience, fly-ball, search and rescue, and as therapy dogs.